'Ordinary theology' characterizes the reflective God-talk of the great majority of churchgoers, and others who remain largely untouched by the assumptions, concepts and arguments that academic theology takes for granted. Jeff Astley coined the phrase in his innovative study, Ordinary Theology: Looking, Listening and Learning in Theology, arguing that 'speaking statistically ordinary theology is the theology of God's Church'. A number of scholars have responded to this and related conceptualizations, exploring their theological implications. Other researchers have adopted the perspective in examining a range of Church practices and contexts of Christian discipleship, using the tools of empirical study. Ordinary theology research has proved to be key in uncovering people's everyday lay theology or ordinary dogmatics. 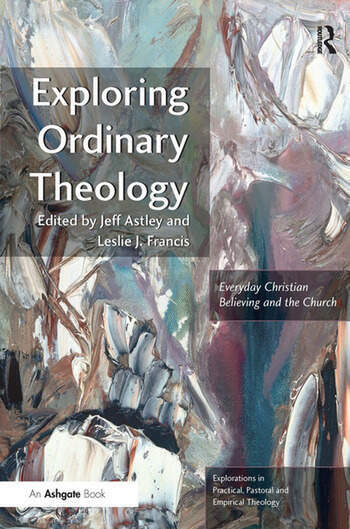 Exploring Ordinary Theology presents fresh contributions from a wide range of authors, who address the theological, empirical and practical dimensions of this central feature of ordinary Christian existence and the life of the Church. Jeff Astley was appointed as Founding Director of the North of England Institute for Christian Education in 1981. He is Honorary Professorial Fellow in Practical Theology and Christian Education at Durham University, and visiting professor at Glyndwr University and York St John University. He is the author or editor of over thirty books on Christian education, practical theology or religious faith. Recent books include: Ordinary Theology (Ashgate, 2002), Exploring God-Talk (Darton, Longman and Todd, 2004), Christ of the Everyday (SPCK, 2007), and the SCM Studyguide to Christian Doctrine (SCM, 2010). Leslie J. Francis is Professor of Religions and Education within the Warwick Religions and Education Research Unit, University of Warwick, and Canon Theologian at Bangor Cathedral, Wales. He is the author or editor of over fifty books, and has authored or co-authored over five hundred papers, mainly within empirical and practical theology, the psychology of religion and empirical psychology. Recent books include Faith and Psychology (Darton, Longman and Todd, 2005), Urban Hope and Spiritual Health (Epworth, 2005), British Methodism (Epworth, 2006), Gone for Good (Epworth, 2007), and Preaching with all our Soul (Continuum, 2008). Jeff Astley and Leslie Francis have collaborated in editing a number of collections of original essays in Practical Theology and Christian Education, most recently The Idea of a Christian University (Paternoster, 2004), Religion, Education and Adolescence (University of Wales Press, 2005), Peace or Violence (University of Wales Press, 2007), Empirical Theology in Texts and Tables (Brill, 2009), and Teaching Religion, Teaching Truth (forthcoming).